Silver Roman denarius of Diva Faustina the Elder, dating to AD 141. Mint of Rome. 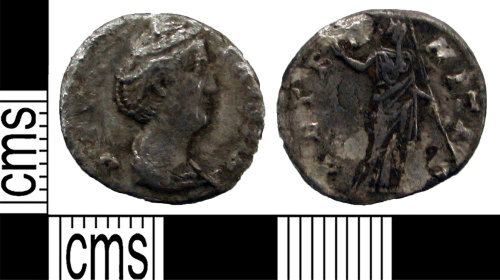 Obverse of draped bust, right: DIVA FAVSTINA. Reverse of Juno(?) standing facing left, holding sceptre and raising hand: AETE-R-NITAS. The coin is 17.0mm in diameter, 2.3mm in thickness and weighs 2.38g. RIC III, Antoninus Pius, p. 69, no. 344.